View of Bangor in Caernarfonshire, Wales. 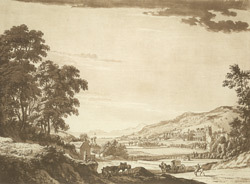 The origins of Bangor date to the establishment of the Cathedral, which can be seen in this picture at the foot of the hills. In 525, Deiniol a Celtic missionary, established a monastic community on this site. The name Bangor comes from the Welsh word for fenced in enclosure and refers to this monastic community. Bangor remained a small community until the 18th century when improvements were made to the road network and the town was then situated on the main road from London to Dublin. In addition a slate quarry was developed nearby at Bethesda which accelerated the growth of Bangor.